Thanks to the community’s generosity, our 2015 children’s book drive – “Bouquets for Books” – collected 80 new titles for Bexley Public Library and Delaware County District Library. Anyone who donated a new children’s book during the event, which ran Oct 31-Nov. 7, was eligible to receive a free bouquet, up to three per family per visit. It’s boos and bouquets Oct. 31 when Connells Maple Lee kicks off its annual children’s book drive with a kids club event. Children ages 5 to 12 are asked to bring a new children’s book as the price of admission. Participants will make a fall arrangement (photo) and will receive a balloon. The “Bouquets for Books” book drive benefits Bexley Public Library and Delaware County District Library. It benefits Bexley Public Library and Delaware County District Library. Our annual children’s book drive is back for another edition. “Bouquets for Books” returns Oct. 31-Nov. 7 to benefit Bexley Public Library and Delaware County District Library. For each new children’s book they contribute, donors will receive a free bouquet, up to three per family per visit, while supplies last. You can view the libraries’ wish lists here. Every November, Connells Maple Lee holds a weeklong children’s-book drive to benefit area public libraries. To encourage the reading habit, we include a reading list in each quarterly issue of our Connells Maple Lee Kids Club newsletter, Buds. This story about a bunny exploring a garden in the springtime is a perfect read-aloud. Readers will learn the names of 20 different baby animals in this beautifully illustrated classic. This counting book features animal families that live in the Okefenokee Swamp. A baby killdeer chick pecks its way out of its shell and discovers a wondrous world. Older children will love reading about a baby pig who starts out as the runt of the litter but grows up to become friends with a savvy spider. The Connells Maple Lee Kids Club is free to children ages 5 to 12. Membership benefits include a membership card, Web site activities, giveaways, contests, member-only events and the Buds newsletter. Click here to register. From left, Ken Flower, director of advancement and community relations, Bexley Public Library, and Roger Morgan, store manager at Connells Maple Lee in Bexley. In the spirit of the season, we’re so thankful to everyone who helped us to collect 129 new children’s books for Bexley Public Library and Delaware County District Library. Our annual children’s-book drive, “Bouquets for Books” took place Nov. 1-8. 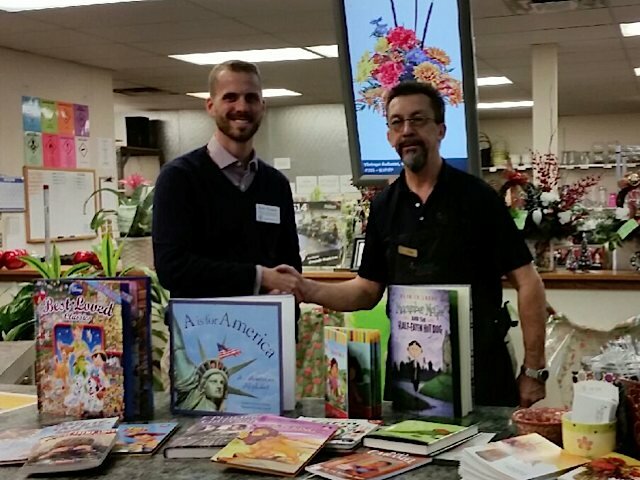 For each book donated, customers received a free bouquet, up to three per family per visit. In its history, Bouquets for Books has collected nearly 800 books. You can be a superhero in your own right by donating new children’s books to our annual “Bouquets for Books” book drive, which returns Nov. 1-8. A book drive to benefit area public libraries represents the final chapter in the Connells Maple Lee Kids Club 2014 event schedule. On Nov. 1, children ages 5 to 12 are asked to bring a new children’s book in support of our annual “Bouquets for Books” book drive. Participants will have an opportunity to make a fall arrangement and will receive a balloon.